Josephine Decker's film is an absolute stunner, with a revelatory turn from newcomer Helena Howard. The notion of authenticity can often get haphazardly tossed around when talking about cinema. Indeed, one's declaration of authenticity can tread a fine line with hyperbole. What are we really saying when we shout "this film is so authentic!" Authentic to what exactly? Well, I can say with great conviction that Madeline's Madeline could have been made by no one else but Josephine Decker (Thou Wast Mild and Lovely, Butter on the Latch), and starred no one else but Helena Howard. This film would simply never exist as it is if it wasn't for their spirits. Madeline's Madeline is what we mean when we talk about authentic cinema; pure cinema, brimming over with euphoria and empathy and a direct perspective of a human, both inside and out, mental and physical, that feels so complete as to be dizzying. Madeline's Madeline is not VR, and nor should it be, but the film's ability to get you to inhabit another being is exhilarating and beguiling and life affirming all the same. So here we are at the story. For a film has to have a story, yes? Howard, in all her charisma and candor, brashness and care, plays the titular Madeline, a sixteen-year old who is living in New York City with her mother, Regina (a wonderfully strange and sensitive Miranda July), but who really looks up to Evangeline (a tightly wound Molly Parker), the head of an experimental theater troupe that Madeline is a part of. And so this tumultuous dance between daughter and mother and the daughter's other possible mother begins when Madeline whispers to Evangeline that she dreamt burning her mother's hand with a hot iron, and in turn Evangeline whispers to Madeline that she dreamt Madeline was her daughter. Even more complicated feelings arise when Evangeline announces that she is pregnant, and Madeline, the supposed star of Evangeline's constantly in-flux play, becomes hard pressed for attention and validation from all sides, any side, her side, herself even. All this is quite a typical tug o' war for a teenager. But what sets Madeline apart is her uncanny ability to totally take on the life of beings she encounters. In the opening sequence she is her cat, purring and licking, jumping and caressing the chest of Regina. Later on as Madeline waits for her mother at the car, a schizophrenic man passes by and she resonates with his whole vibe, wandering away from the car and out into the New York City night, mumbling and growling, twitching with aplomb, caught in a reverie of selves. This is not acting. This is not performance. Madeline is on medication for what she can do. Madeline has been in the hospital for what she can do. It seems a lot safer (and perhaps a lot more dangerous) for her to take these abilities into the realms of acting and performance. At least, Evangeline is impressed. As I get older and my relationship with cinema deepens, my desire for the medium has largely changed from wanting some narrative semblance and intellectual satisfaction or grounding to exfoliating in an emotional and intuitive cinema; one where there are often no answers, but where revelations do come in body and spirit. These films delight equally in the absurdity and poignancy of life. I have also found myself greatly enthused by the notion that pure cinema has less in common with literature and plays and and more so with dance and choreography. The flow of cinema, the slipstream of sculpting in time, is something that for whatever reason (maybe its the generally vanilla drive of commercialism) continues to elude so many efforts in the medium. And so, it is easy for me to say that with her third feature outing, Josephine Decker has given us a gift that exemplifies all the above qualities and then some. 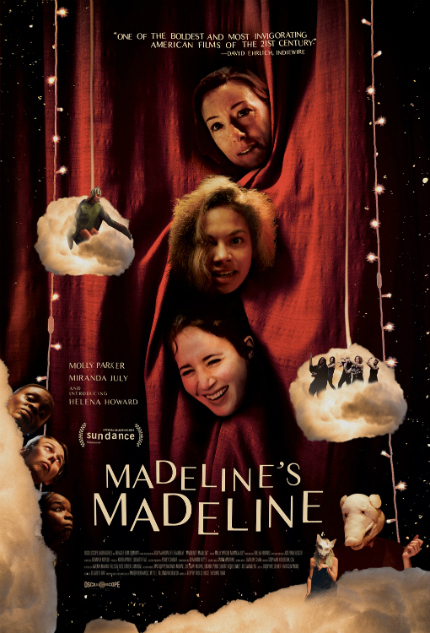 Erratic, expressive and oh so lush, Madeline's Madeline revels in the power of the feminine intuitive; of how such poignant and potent power blossoms in the heart of a very gifted and very angry and unsure young woman. Bringing us into the presence of Howard's Madeline, Decker turns to her long-time collaborator, cinematographer Ashley Connor, to create a gauzy, feverish and intimate visual palette that has left the film banging around in my head like a drum, only building louder, wilder, truer and stranger as the hours and days pass by. One remember's Madeline's Madeline like the very best and very worst dream ever had. This is because you can make complete sense of it, yet it is still a dream and that is troubling. At the core of all this, beating brightly is Howard, a straight-up revelation, who embodies Madeline in all her forms, with a fearless bravada. One excellent example of this is a scene that sees Madeline at a photo shoot for the theater troupe. We hold in close to her, as we often do, with Evangeline off screen asking her to look depressed, more depressed, now even more... And like shadow and light intermingling as they do across a wall in the late afternoon, Madeline's face oh so gently morphs from one person to another to another in real time. Blink and you'll miss it. It brings me great confusion as to why Sundance chooses to put a film so fresh and so exhilarating like Madeline's Madeline into the NEXT section, a program that does not currently have a jury and could have less chance of gaining wider notoriety moving forward. While this will not impede a filmmaker as wholly singular and intuitive as Decker, it makes me wonder about film culture and especially film festival culture. Of course Madeline's Madeline will not be for everyone, but I believe the original point of a film festival is to galvanize culture by championing and exposing people to something they are not going to seek or see in a regular theatrical or home environment. It is my hope that Sundance's acceptance of Decker is not solely about her being a hot filmmaker bringing a film to fruition at the right moment for their agenda. Alas, I think that hope is naive. Still, the kind of vital and visceral filmmaking that Decker exudes gives me cause to wonder if we are on the cusp on a more unified focus for this generation of American directors that have toiled in the micro-budget realm and are now more than ready to be given a healthy influx of resources while still crafting the wildly wonderfully intuitive and expressive cinema that they have been manifesting outside the eye of Sundance this whole time. If Decker can back that charge then a deluge of works from the likes of Nathan Silver (Uncertain Terms), Paul Taylor (Driftwood), Joanna Arnow (Bad at Dancing), Theodore Collatos (Tormenting the Hen), Britni West (Tired Moonlight) and Celia Rowlson Hall (MA), could fall under a greater spotlight. Or maybe, that's just me being naive again, and what we have always thought of bout independent cinema as being authentic is just really a lot of festival politics and cool kids' club posturing and of course, privilege (which, if I am being honest with myself and with you, many of the aforementioned filmmakers do have, especially since I only cited white people). Or maybe this all proves Sundance is truly nearly dead to adventurous cinema and Decker's presence is something of an anomaly. I digress. Let us wrap this up for the moment and close on a forward thought: if there is one thing a film like Madeline's Madeline leaves us with, it is with the notion that if we are so busy trying to understand ourselves we cannot, ultimately know ourselves, and thus, be ourselves. Decker and Howard and co. ask us to start down that intuitive path. And from there... well, the sky's the limit. Review originally published during the Sundance Film Festival in January 2018. The film will open via Oscilloscope in U.S. theaters on Friday, August 10; visit the official site for more information.